Hi friends! Today when I was getting ready for work, I was feeling rather bold, so I decided to bust out a recent purchase. Yes, it is a LIME. GREEN. blouse. And I LOVE it! I'm not ashamed - I've totally been getting spray tans 1-2x per week for the past month or so as summer draws nearer, and I'm finally at the stage where I look "normal" tan (ya know, not to light, not to orange, not too dirt-smeared looking). SO, obvi it was time to throw this baby on & rock it with confidence now that I no longer look like a pasty white vampire! I wanted the lime green to be the biggest statement color in my outfit today, so I paired the blouse with skinny jeans and gold/black accessories & shoes! I personally prefer the dirt-smeared look. Thanks so much for taking the time to check out my blog! 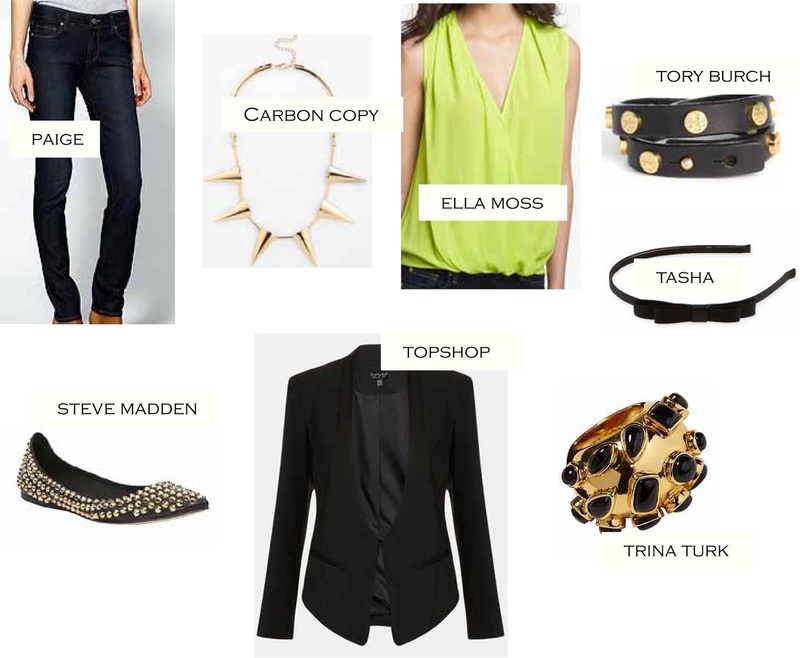 I love that Ella Moss blouse. I'm definitely going to need some more neon in my life now that spring is here! Thanks for stopping by mine as well Kaitlin! I know, I feel the same way! I love the pop of neon against the black and gold. Nice mix. I love lime green, it's great to see how it pops next to neutrals! I need to get a spray tan before I head down to Florida for a friend's wedding. I am literally a ghost right now, which makes it hard to look good in my spring clothes. I love that Topshop blazer! It's perfection.